In 2011, Yaelisa created this first-of-its-kind teaching site as a way to help her local students progress by having more access to daily classes in brazeo, taconeo, marcajes, combinations and each lesson/choreography covers information on the particular cante, study of the phrasing and compás that is so essential to the growth of the flamenco dancer. After two years online, she has decided to advertise this unique hub, which is a great addition to regular general or private lessons, but delves deeply into elements that some of those classes cannot cover. 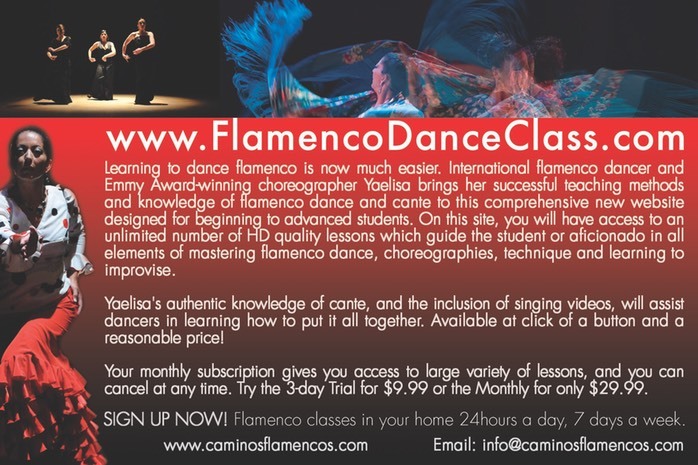 FlamencoDanceClass.com is a great assistance to students anywhere in the world, or who have limited access to qualified instructors. Yaelisa's teaching covers every single aspect of learning the art form, a methodology proven to be successful in 25 years of training, coaching and mentoring flamenco dancers and guitarists. With the click of a button, you are online and ready to practice! One of the best flamenco websites around. The perfect tool for singers, dancers & guitarists wanting to understand the structure and style of flamenco forms. From basic to advance levels Yaelisa explains and demonstrates each lesson in an easy to understand and structured way. Definitely worth $30 a month!